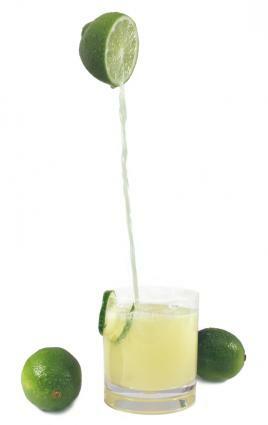 A kamikaze is a delicious and refreshing cocktail that includes lime juice, triple sec, and vodka. The cocktail is traditionally served in a chilled lowball glass, although some people serve it as a shot or in a martini glass. The basic kamikaze is simple to make because it includes equal measures of its three ingredients. It is best when made with fresh lime juice and high quality vodka. Shake until drink is well-mixed and chilled. Serve in a short chilled lowball glass and garnish with a twist of lime. You can also vary the basic kamikaze recipe to make other delicious cocktails. Cranberries add a hint of sweetness to this tart drink. Shake until well-mixed and chilled. Pour into a chilled martini glass. Garnish with a twist of lime. Blue curaçao replaces the triple sec, giving berry flavor and a bright blue color. Pour into a chilled lowball glass. You can still enjoy the flavors of a kamikaze in an alcohol-free cocktail. Shake until drink is well-combined and chilled. Serve in a lowball glass with a twist of lime. Because it is tart, a kamikaze makes a refreshing alcoholic beverage. Enjoy one the next time you have a cocktail.